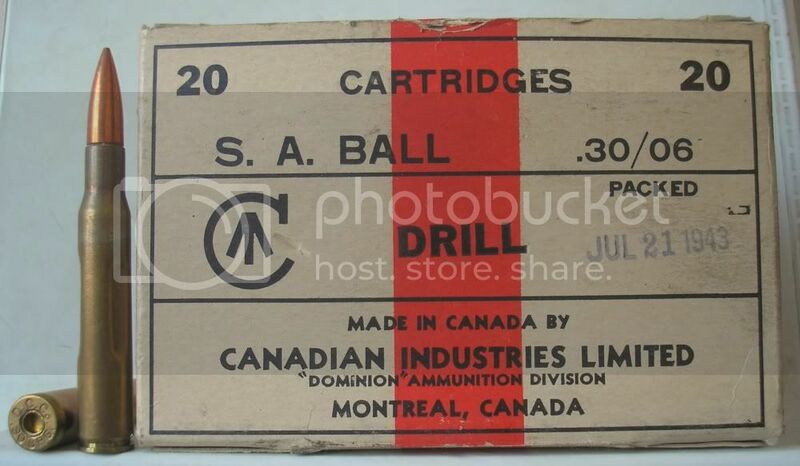 Here is a picture with some Canadian made cartridges with DI headstamp produced by Defence Industries Ltd. Some sources indicate that factory which used headstamp DI was situated at Verdun, other sources indicate it’s place as Park Avenue Plant, Montreal. Which info is correct? The Story of “DI” ( Defence Industries) is an interesting one. It was set up in 1940-41, to manufacture ammunition, using Boxer primers, rather than the common ( British) Berdan primers used in the Government ( Dominion Arsenals Canada series of Plants). For this, the technical assistance of Dominion Cartridge Co (Canadian Industries Ltd), was engaged, because they had been making Boxer primed Sporting ( and some Military Contract) ammo since before WW I. A completely new Plant was set up in Montreal and became “DI”…because of Shipping difficulties across the Atlantic, the Machinery was acquired locally or from the United States. The Plant produced .303 to Aircraft use standard, usually found in 48 round packets or belted, in Ball and Tracer and Possibly other types, and also 9mm. 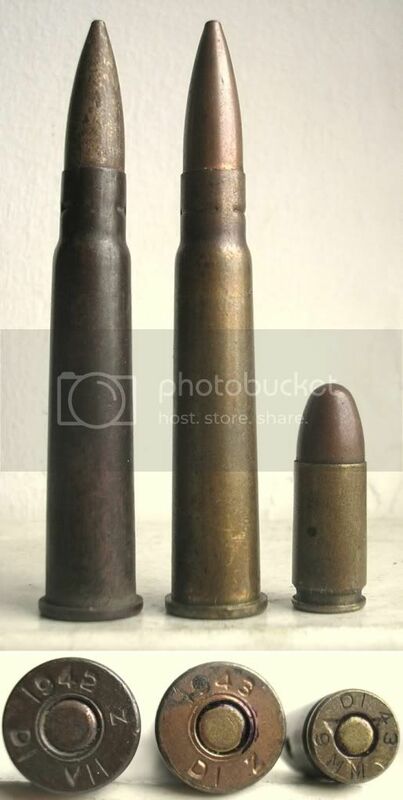 The Question of 7,9mm production for China is disputed hotly on these and other Boards, as is the question of Covert 7,9 and 9mm ( the “7,92MM” and “9MM” with wartime year dates.). Lots of .455 and .380 for revolvers sort of rounds out the wartime production. Dominion Cartridge had made .30/06 in 1918, but it is not certain if DI made any .30/06 during WW II. At War’s end, DI was terminated as a Gov’t/private Plant, and the machinery dispersed to both DAC ( Govt. factory) and back to Dominion Cartridge Co.
DAC was making Boxer primed .30/06 in the 1950 & 60s. ( French-English) name stems from the fact that in the late 1970s, to placate the Quebec Independance movement, the Gov’t of Canada decreed that all Company Names, Product labels, etc in Canada, or imported for use in Canada, be Bi-Lingual in French and English. Companies based in Quebec Province would have French first, and English second. The other provinces vice versa. This sort of dates the appearance of the IVI headstamp. As to the use of the triangular primer crimp, this is just a factory variation; depends on the primer crimping machine set-up used. Most DI ammo used the Ring crimp; the triangular crimp seems restricted to 9mm, although I have seen 9mm using the ring crimp as well from DI. Hope this general history is of use…please correct if there are boo-boos. The Park Avenue Plant, in Montreal, is correct for the D.I. Headstamp, as Doc Av pointed out. I wrote an article many years ago on Canadian auto pistol ammunition, and the first installment printed was so full of errors that I received a rather irate letter from J. w. Houlden, formerly of Canadian Industries Ltd. My first instinct, always a bad one, was to write him and due to the Sources I used for my article, all Canadian ones, tell him he didn’t know what he was talking about. Sanity prevailed and I wrote him a nice letter asking who he was, what his credentials of “expertise” on the subject were, and where did I go wrong. I got back a very friendly letter, with an apology for any vitriolic content of his first letter, along with a wealth of information. To make a long story short, we became friends. To quote my own article, “In 1939, C.I.L. set up various facilities for munitions production under the name Defence Industries Limited. Aljhtough built and operated by C.I.L. during the war years, the Canadian Government paid for them and repossessed them after the war. The 9 mm Parabellum rounds made during World War II, bearing the 'DI” headstamp, where manufactured at a place called the ‘Park Avenue Plant’ in the northwest sector of Montreal. The plant produced 60,000,000 rounds a month. According to Mr. Houlden, who was deeply involved with these operations, the pilot, or trial runs of the 9 mm cartridge wer made in Brownsburg by the D.C.Co., part of the group, and bearing the headstamp ‘DC 42 9MM’ for the trials and acceptance of design. This headstamp is quite scarce." Part of the evidence of the “9 MM 40” throu “9 MM 45” headstamps on some Canadian 9mm Para ammunition being clandestine, and not made in the years indicated by the headstamp, is the fact that the pilot run of 9 mm made in Brownsburg was the first 9 mm Para ammunition made anywhere in Canada. That, of course, makes the “40” and “41” dates of the clandestine series absolutely spurious. military property mark), and DAQ for Dominion Arsenal, Quebec. After a time, again as Doc AV said, the Canadian Government sold all of its Canadian Arsneals Ltd. Plants. The plant at Valcartier was sold to Industrie Valcartier Incorporee (actually purchased by the province of Quebec). It seems that no Government-owned ammunition facility exists in Canada, unless they have been built in fairly recent years. Note that from the time Defence Industries Ltd. was conceived, it took three years to get 9 mm production going. Defence Industries was a wholly owned subsidiary of C-I-L (Canadian Industries Limited) formed in September 1939. It had a plant in Brownsburg, Quebec which was in the same physical building as the C-I-L production line which made SAA. It also had a plant at Verdun, in Montreal (used h/s “VC”) and a facility in the village of Nobel in Ontario (See IAA Journal 467) which made explosives and propellants. By far its largest plant was the facility built in 1941 in what is now Ajax, Ontario where it made artillery shells. C-I-L / D-I-L actually built the town which, initially, was called “Dilville” but was renamed “Ajax.” The plant employed 9,000 people and occupied almost 3,000 acres. In late 1945 production in D-I-L Brownsburg and Verdun stopped and the D-I-L SAA equipment was stored at Dominion Arsenal’s facility in Quebec City. In the late 1940s some of this was sold to the Chinese government (explaining some Chinese 30-06 loaded using the C-I-L patented “Richardson” primer). The company (D-I-L) was resurrected in 1951 but did not make ammunition at that time. IVI was formed as a corporation in 1967 specifically to purchase the Dominion Arsenals from the Canadian Government. Chris Punnett, formerly Director of Technology, Canadian Industries Limited. Yes, the “Richardson” primer has a cup-shaped disk anvil with two flash-holes. Creighton Elliott Richardson was issued Canadian patent 370,982 in 1938 (patent application was from 1936) and assigned it to his employer, C-I-L. He also applied for a US patent on Sept 3, 1937 and was issued US Patent #2,188,760 on Jan. 30, 1940 for the same primer.